In September 2013, Camelot decided to increase the price of The National Lottery to £2. A far reaching marketing campaign accompanied the announcement, highlighting that customers now had more ways to win and underlining the way in which the company distributes the money raised. A year on from the announcement, we can use YouGov BrandIndex to analyse recent efforts to win the hearts and minds of consumers. In July, Camelot commenced a campaign aimed at communicating to its customers the investment it makes in ‘good causes’, having conceded that the public may not be fully aware of how money raised by the game is spent. The ‘play makes it possible’ campaign went live in July and was supported by TV, print, outdoor and digital activity and is various retail outlets. Using YouGov’s BrandIndex Ad Awareness metric, we can assess how successful the recent spot has been. Firstly, from July to the end of September, we see that a very healthy percentage of people recalled seeing a National Lottery advert in any medium. The average score is a very strong 25.7% over this period of time, reaching a high point of 28.8% at the tail end of September, showing the campaign most definitely still has legs. Another area to consider is how the strong scores shown are translating into sales and money generated. One way we can analyse this is to look at YouGov’s Purchase Intent metric. In this measure, the percentage of respondents who are considering playing the lottery can be ascertained. Again we see a very strong performance from National Lottery. The average score in this metric is 32.0, so almost a third of respondents are at the least considering playing during the time period. Elsewhere, YouGov’s Buzz metric assesses whether a respondent has heard anything positive or negative about a particular brand over the last 2 weeks. We can see that National Lottery has a positive score during the last three months. One reason for this may be the National Lottery Awards, which aired on the 19th September. The awards recognised the inspirational work of National Lottery funded projects across the UK and generates positive press for the brand. 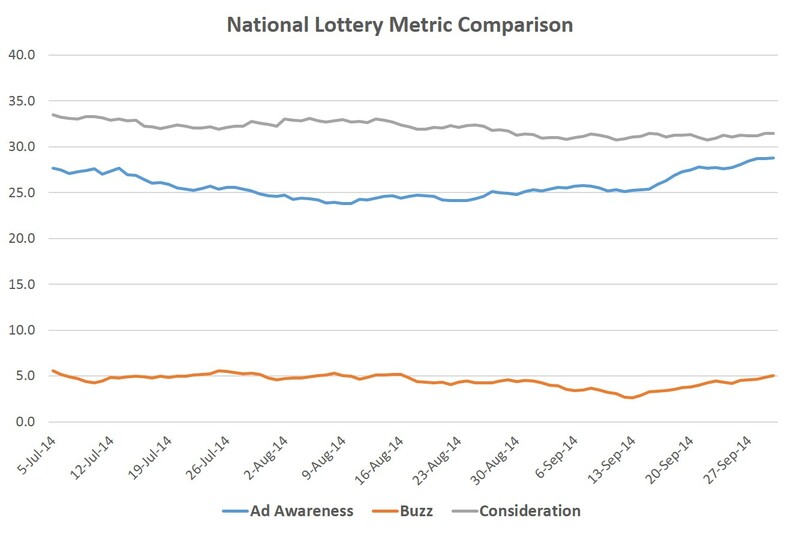 The Buzz score for the lottery currently stands at +5.0. It’s clear that the aims of the brand to communicate their overall raison d’etre is working, consumers are recognising National Lottery’s attempts to consolidate the impression that their ‘good causes’ goes hand in hand with the games to be played.